WASHINGTON (Aug. 10, 2015)—At a maximum speed of 25 miles per hour, sea lions may not be the fastest-swimming mammal in the sea. But they are unrivaled when it comes to stealth—their signature clap-and-glide flipper motion propels them through water and leaves virtually no wake. Megan Leftwich, a George Washington University professor of mechanical and aerospace engineering, took notice of this anomaly during a visit to the Smithsonian National Zoo with her children in 2013. While other mammals use their tails or additional fins to help them swim, leaving wakes, sea lions flip and spin without the added help, and without the wake. Dr. Leftwich wondered how they did it and, being an engineer, she speculated whether researchers could replicate the motion. To answer this question, Dr. Leftwich and her team videotaped sea lions swimming at the Smithsonian's National Zoo to capture the foreflipper’s movement frame by frame and track points on their “arms” to mathematically describe the flapping motion. They used the mathematical description to design a plastic robotic arm that mimics a sea lion’s shoulder, elbow and wrist joints. Then, Dr. Leftwich 3-D scanned and printed a sea lion foreflipper to cover the “arm” with a silicone version of the skin to study the possible effect wrinkles and hairs have on the drag when swimming. 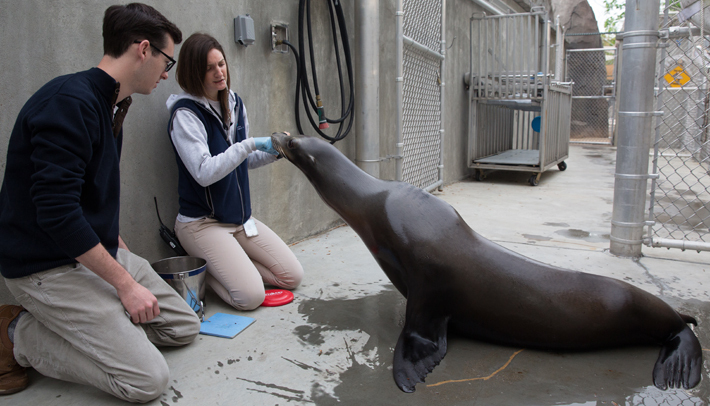 These studies were conducted in GW’s Science and Engineering Hall using flow diagnostic techniques to chart the fluid’s movement and the forces it takes for a sea lion to move its foreflipper. Dr. Leftwich chronicled her research in a paper published last month in the Journal of Aero Aqua Bio-mechanisms. Her next step is to bring the robotic foreflipper to SLEWTHS (Science, Learning and Education With The Help of Sea Lions), a teaching aquarium in California, to test her experiment directly with animals in their natural habitat. Dr. Leftwich hopes her research may one day lead to larger machine-based underwater projects, such as searching for shipwrecks or disarming underwater bombs in autonomous vehicles.